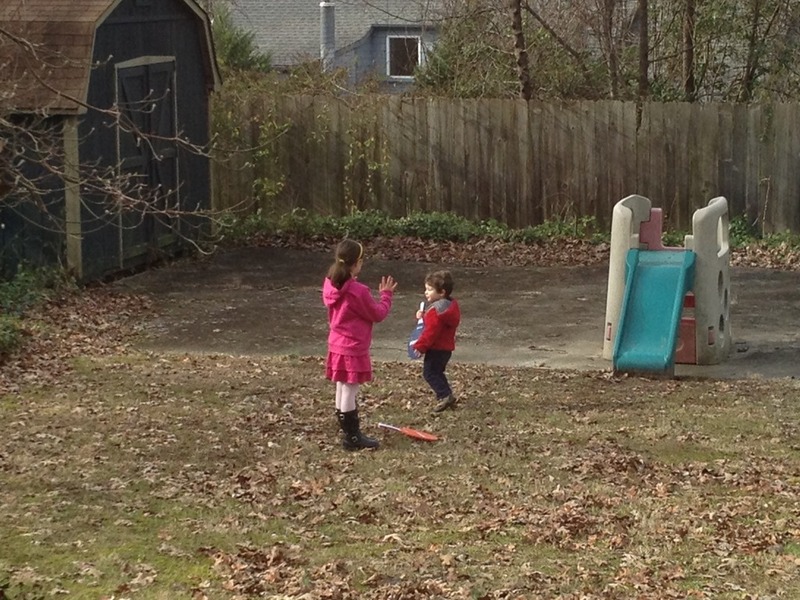 New Year’s Day: I am standing at our back window watching the kids play in the backyard. This is a new development, the two of them playing outside by themselves. When I sent them out there I intended to work on one of the myriad post-holiday household chores, but instead I am standing at the window, just watching. The scene is breathtakingly beautiful to me, for all the cliché reasons: the winter sunlight on their hair, the way they are negotiating the rules of some game they just made up, the promise and possibility at the dawn of a new year. They are unaware of how fleeting these moments are: the blink of an eye and they will be grown and gone, this particular morning no more remarkable than any other morning of their childhood. I am feeling emotional already, by the time I see them out the window, because we packed up the Christmas decorations this morning. I usually like to leave the tree up until Epiphany – Christmas isn’t really over until the magi arrive – but this year, we got back from our whirlwind trip to my parents’ and it felt like Christmas had thrown up all over our house. I was tired of the clutter; I wanted it gone, cleaned up, back to normal as soon as possible. So I didn’t expect to get all weepy when the living room was finally bare, all over but the vacuuming. I suppose I started getting sentimental about the time I came across the ornament my daughter made in 2009 – the Christmas she was two, our first holiday in this house. Now she’s a tall, lanky first-grader, a totally different person from the chubby cheeked toddler smiling at me from the crinkled paper wreath. Then there was the Advent wreath we’d had so much fun lighting this year, and we stopped the packing for one last reading of Mr. Willoby’s Christmas Tree. By the time I packed up the tree skirt made by my grandmother, who died at Christmastime 12 years ago – I always look for the handwritten “I love you” note still pinned to the bottom – I was undone. I didn’t know it yet, though; I’m quite good at ignoring how I’m feeling and snapping at my husband instead (which is really fun for everyone, let me tell you). So when the decorations were put away and he suggested, perfectly reasonably, that we reorganize some bookshelves in the upstairs office and I got snippy, I thought what is wrong with me? and I made myself stand in the living room, in the spot where the tree had stood just an hour before, until I figured it out. It was this house. This was our fifth Christmas in this house, the longest we’ve ever been any one place. This house that has now seen five Christmas mornings with our family, some with cousins, aunts, uncles and grandparents, some with just the four of us, always with my mother’s Christmas morning coffee cake. We’ve packed up our decorations in the attic five times now. I’m starting to lose track- was that the year your parents were here? or when your brother came the weekend after? was that the year she got the hula hoop? There’s no way to hold on to all that, it all blends together, soaking into the walls of the house, getting packed away with the ornaments. We don’t have any immediate plans to go anywhere, but someday, we will. Someday, we’ll be boxing up all our stuff, not just the Christmas decorations, and then it won’t just be the Christmas memories that get brought up, it’ll be the memories of our whole lives. The longer we stay, the more attached we become, the harder it will be to leave. And they don’t even know it, playing out back right now with the paddle ball set they got for Christmas. My daughter is giving orders, as usual, and her brother, always game for whatever she’s doing, is following along. They don’t know what a precious scene they are creating for their mother, spying on them from the kitchen. That’s as it should be, of course; they ought to be living their lives, not wondering how they will look back on these days in the years to come. I watch for another minute, then turn back to the cleaning up. This is life, I suppose, this coming and going, this making of memories and moving on. This is our life, in this house, for now, and for now, it is good. Lee Hull Moses is the co-author of Hopes and Fears: Everyday Theology for New Parents and Other Tired, Anxious People. She lives with her family in Greensboro, North Carolina, where she is the pastor of First Christian Church (Disciples of Christ). Tags: children, christmas, family, kids, memories, New Year's. Bookmark the permalink.